Using Microsoft Server Virtualization and Dell Compellent Storage Virtualization to Improve Delivery of Infrastructure as a Service. Virtualization and the emergence of private cloud computing provide today’s organizations with powerful new ways to equip business groups with the computing and infrastructure resources they need. This white paper outlines an approach to creating a private cloud computing environment that enables an organization to meet the needs of diverse constituents quickly and with high efficiency. 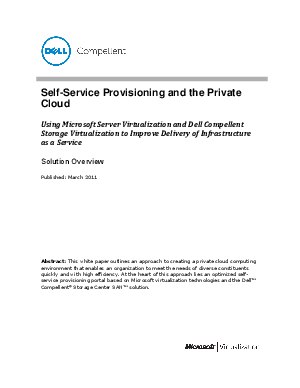 At the heart of this approach lies an optimized self-service provisioning portal based on Microsoft virtualization technologies and the Dell™ Compellent® Storage Center SAN™ solution.